Every year, college students around the country are moving into new housing. Some students will live in the school dorms, while others will seek housing off campus. This latter group often faces a number of challenges when trying to arrange furniture for their new place. Should they buy new furniture for a place that they will only live in for a few years? Or, assuming students generally have a limited budget, can the used furniture market meet their needs? I wanted to better understand how technology can help students achieve their basic furniture needs by investigating the following questions: How do students assess the quality of used furniture online? Are the sellers trustworthy? How do students figure out the logistics of moving furniture (often without a car)? My role: this is a personal project. I conducted a range of user research activities, interaction design and two rounds of hi-fi prototypes. Method: interview, personal inventory, focus group, survey, competitive analysis, expert review and usability testing. This personal project started from a thought I had one morning: what am I going to do with my furniture, appliances, and kitchen stuff when I'm about to graduate? I started this project by understanding what other students' experience and opinions were in used markets. In order to familiarize myself with the common problems that students had, I talked to these three groups of people: current students, students who are about to graduate, and students who graduated in the last year. In the existing online used markets, there were two kinds of users: sellers and buyers. The gap among students of trading used furniture was the logistics, where the gap could be filled by people who are willing to help with their cars. 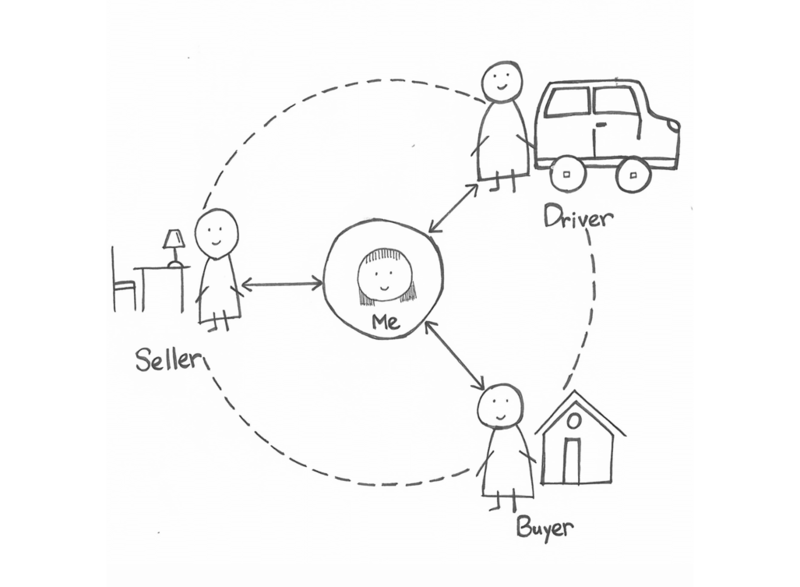 Thus, I included different roles into this project: Sellers, Buyers, and Drivers. I matched them together to see the real-money transactions and interactions. In order to observe their interactions, I was playing as a people-person platform among them (as seen relationship diagram above). I kept two threads going at the same time: one was matching Sellers, Buyers, and Drivers to observe and learn from their interactions; the second thread was going through the design process: from the user research to ideation, lo-fi prototypes, and two rounds of hi-fi prototypes. Each step will be explained in the following. Matching Sellers, Buyers and Drivers in real life was not only to observe interactions, but also to have candidate bases of these three roles. With the candidate bases, it became easier to find participants for user research activities. To understand people's needs and behaviors. For example, how people check the quality of used products or how they negotiate. To know how the platform handles transactions. To experience what challenges the platform might have and innovations it can achieve. Brochures were everywhere on campus. Mine was at the bottom-left in this photo. 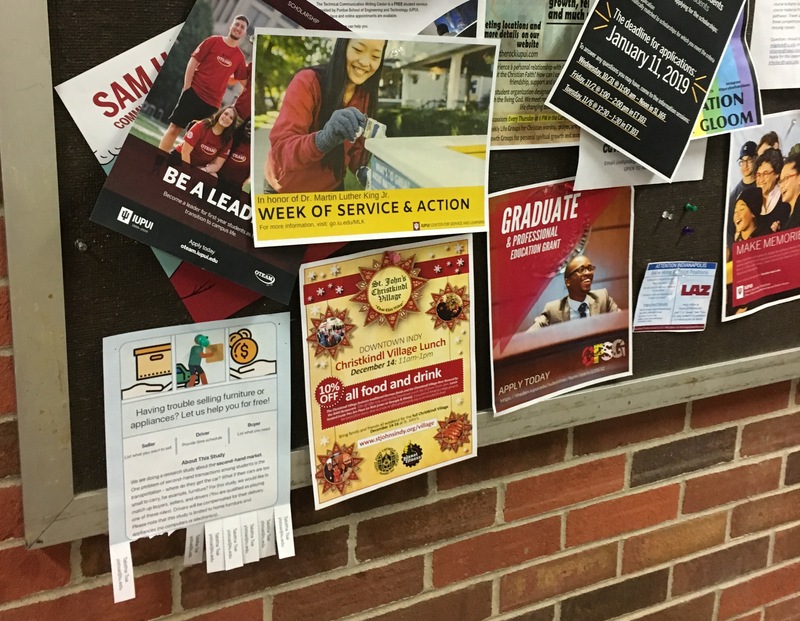 In order to reach out to as many Sellers, Buyers and Divers as possible, I attached brochures (as seen the brochure above) to public boards on campus, and released the information on school-related digital platforms, including school Facebook pages and instant message groups. The outcome went well. Some students were interested in being one role of this project, and some were excited to see the solution happening. Till February 2019, the total amount of transactions I've been observing was $228.50 USD (as seen the transaction history above). 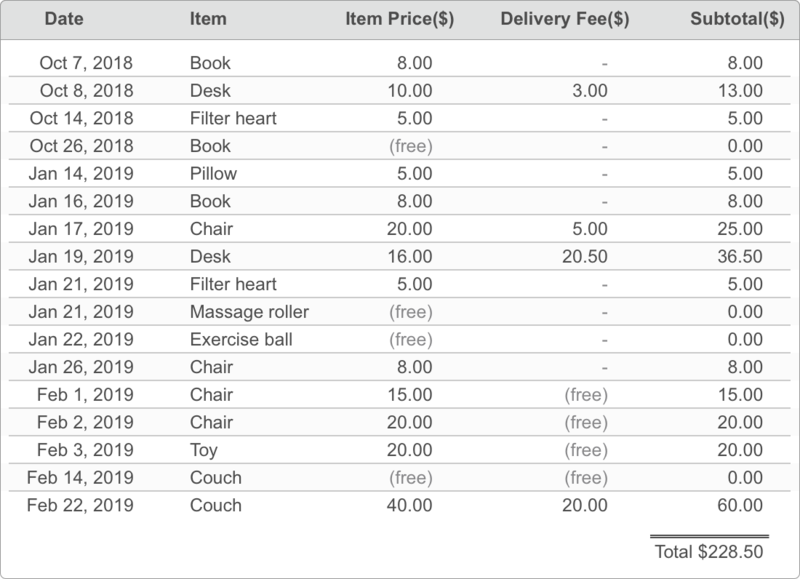 It felt so good to help students get furniture, but sometimes I felt frustrated when, for example, a Seller reneged on a deal for a higher price. Nevertheless, I could experience these in person, so that I was able to consider these challenges into the design. One interesting experience was one time a student asked me to find a pillow for him. Due to the time limitation (I got this request around midnight) and I really wanted to observe the interaction of this pillow transaction (A request for a used pillow? I believe people are different even more), I sold out one of my pillows by video streaming (as seen the video below). Furniture was dumped into trash. I also cultivated a weird behavior: watching big trash containers around my campus. 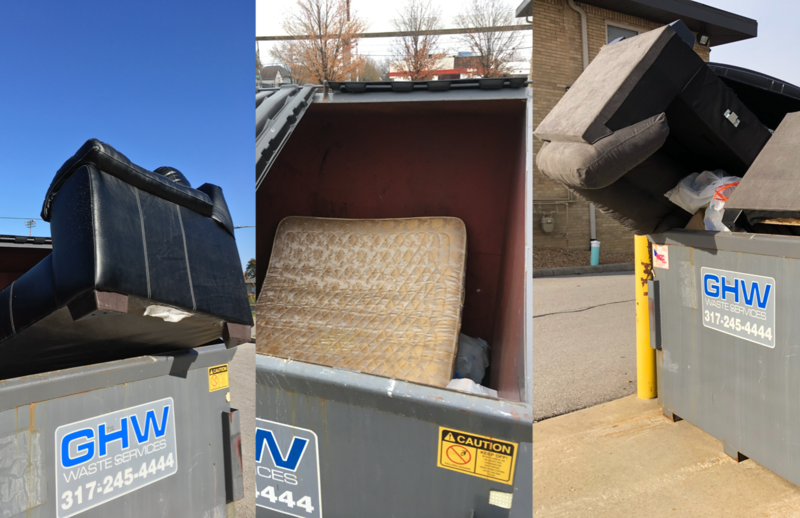 Sometimes furniture was in the trash can (as seen in the photos above), and I couldn't know the reason owners threw it away but told students who needed that kind of furniture; Other times I caught owners while they were about to throw furniture away and talked to them. Remote interview: with 5 people who had graduated less than one year ago - to know their experience of moving out. Personal Inventory: with 3 students who were about to move out - to know what they would do to their furniture. Guerrilla interview: with 12 students who currently studied at school - to know how they had their furniture. Focus group: with 3 students one in each role - to observe their interactions. Survey: with 100 responses - to broadly understand users' concerns in used markets. Usability testing on competitors' websites: with 12 students - to learn from both competitors' advantages and disadvantages. By conducting 5 remote interviews with people who had graduated less than one year ago, I asked them about their moving-out experience: what furniture they had and how they dealt with them. Used school-related, digital platforms to reach out to potential Buyers. Thought that pickup was Buyers' responsibilities. One interviewee's experience of selling his mattress. One of them said 'I just want my house to be empty.' However, this person sold the monitor on Facebook Marketplace, but the Buyer didn't show up. This person ended up leaving the monitor at his apartment because this happened at his last day at school. One of them preferred to sell things on Facebook Marketplace, where he could reach out to more potential Buyers, compared to school-related platforms. In this case, the only way to judge if Buyers were trustworthy was to check their profile pictures. From these 5 previous students, school-related platforms made them feel safer but had fewer potential Buyers. On the other side, public marketplaces had more potential Buyers but it's more likely people reneged on offers. By conducting 3 personal inventories with students who were about to move out (because of graduation). I asked them to show me their apartments and how they would do for their belongings which they wouldn't take with. All (3 of them) said they would ask their friends and replacements for taking their belongings first. Moreover, all said logistics was an issue whether they couldn't or didn't want to help carry furniture to Buyers' cars or apartments. You needed to think about how to move things to meet points only for $5 or $10 dollars. It's faster if you just threw everything away. From 3 personal inventories, I found people preferred interacting with people they were familiar with. Moreover, students who were about to leave might throw away usable furniture into dumpsters. How would technology encourage these people to give out rather than throwing away? By conducting 12 guerrilla interviews (including two pilots), I would like to know what the current students' experience of having furniture was. One day, I just sat near the laundry room and asked people, who passed by, if they were willing to share their experience. 4 (out of 12) of them had experience of buying used products for their apartments. 5 (out of 12) students considered of buying used products if they had a car. 6 (out of 12) of interviewees concerned about the quality of used products. For example, bed bugs. 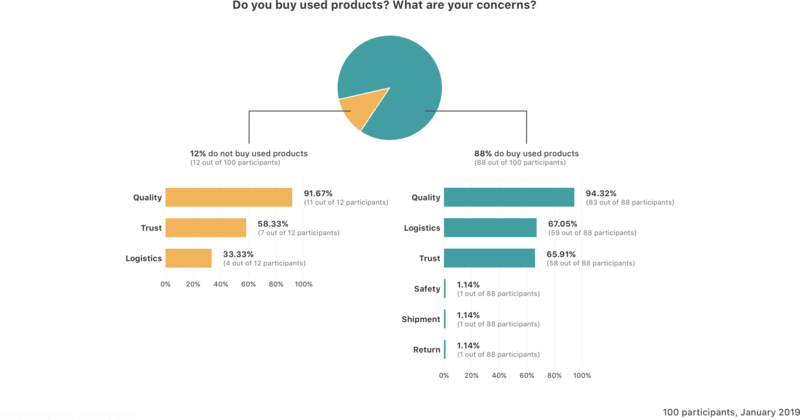 The bar chart shows 12 interviewees' experience related to used products. From these 12 guerrilla interviews I found there were two issues: 1) people didn't know how to check the quality; 2) people didn't have cars to pick up if items were not in a walking distance. Some of the students didn't have cars or connections to ask for help, especially for new students. How would the technology help them check quality and have a way to pick up? One participant was about to move out - a Seller. One participant was a current student, who considered buying used products for her apartment - a Buyer. One participant was a current student, who was willing to help students to move with his car for some gas fee - a Driver. To have a 30-minute coffee & chocolate cake (I made it!) time before the activity because 1) participants could get used to each other through casual conversations; 2) it had a time pool to allow participants to get late a bit. To ask participants to jot down their thoughts before starting discussion because 1) to give them individual time to think; 2) to make sure everybody talked. Quality: quality was what participants cared about the most, while dealing with strangers. From the discussion I found that all (three of them) preferred to take a look at products before purchasing if items were in a walkable distance. Logistics: if people just came to a new place, they might not have connections (friends) to ask for help, while people were not sure if ride-sharing services, for example Uber, took the case of delivering furniture. The most interesting part of this focus group activity was that you saw different points of views happening back and forth. For example, when they were discussing the content Sellers should provide, people on the Buyer side needed more information or photos to make an informed decision, but people on the Seller side mentioned that providing a lot of information might disencourage Sellers to use this application. The other example was about how much gas fee should be charged for helping delivery within 2 miles (as seen the storyboard below). The Buyer side said $5 to $7 dollars (the participant said this was how much Uber charged for 2 miles) were more reasonable, after the Driver said that he would help deliver with $15 gas fee. Thus, I needed to keep the flexibility in design in order to help negotiation. In order to reach out to more people, I conducted an online survey, which I sent through school-related social media. In 100 responses, there were 88% (88 out of 100) participants saw purchasing used products was an option and 12% (12 out of 100) people wouldn't buy used products (as seen the pie charts below). Whether people buy or not buy used products, they had the same concerns on online used markets. Moreover, for those who were potential Buyers in used markets (88 out of 100 participants in this survey), they used several ways to check the quality according to their previous experience: photos, reviews, in person and videos. 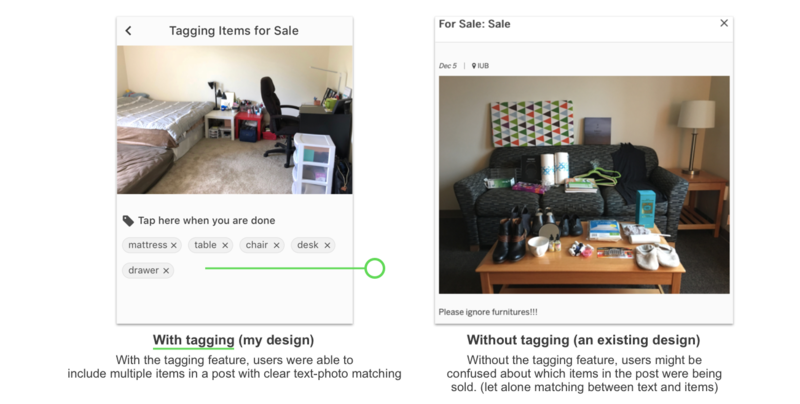 To better understand how existing platforms worked for displaying products online, I chose six online platforms (eBay, Amazon, Target, Walmart, IKEA, and OfferUp), and recruited 12 students to conduct the usability testing (as seen an activity photo below). A photo of conducting a usability testing on a competitor's website. 18 photos on the right were the testing materials. In the second-half testing, I gave another 9 photos, and asked them to type the keywords for each photo. I would like to know the difference and behaviors of words they used to describe products. The takeaways were that using keyword searching was a common user behavior. 10 (out 12) participants asked if they could use keywords for locating items in the first-half of testing. Moreover, people used different words to describe the same item. For example, the name of this item (see the picture below) could be: mattress frame, bed frame, cot, mattress holder and bed box. This reminded me to maintain flexibility and intelligence while designing a keyword-related feature. People used different keywords to search for this product: mattress frame, bed frame, cot, mattress holder and bed box. Quality: people didn't know how to check the product quality. Trust: people were not sure others on online marketplaces were trustworthy. Logistics: people didn't know how to pick up items if they had no cars. Target users are able to complete a post with their phones only, which have the camera feature. Based on the user study, users browse used products even when they are not aiming to buy specific items. Thus, Buyers are able to browse items anytime anywhere with their smartphones. Negotiation is so crucial when a transaction included multiple people. Millennials check their phones more frequently than their desktops, so the phone is the best tool to stay in touch. How might I make the online experience simple and easy, so that encourages Sellers to post online rather than throwing furniture away? How might I make sure people get what they expect online? How might I build the trust among people online? How might I provide logistics to fill up the gap between Sellers and Buyers? 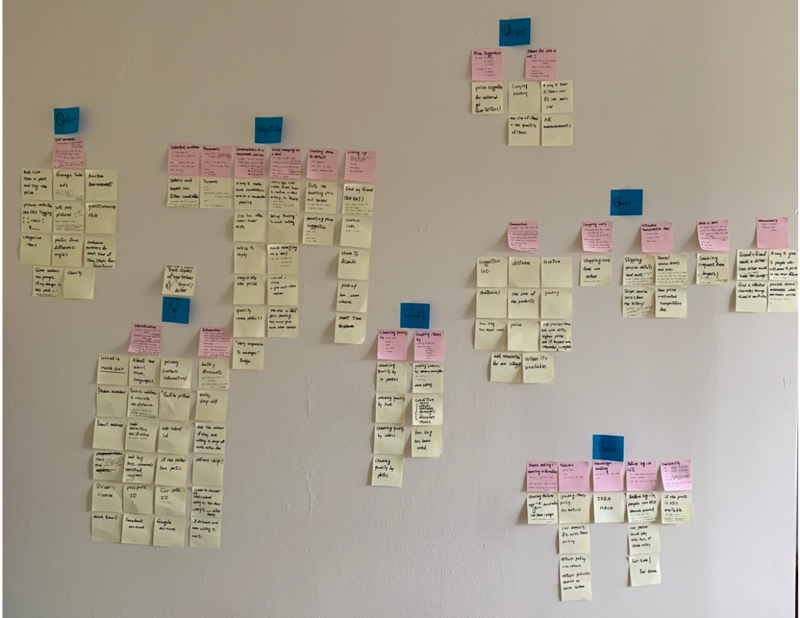 I started building wireframes by papers, and sticked those papers onto the wall (see wireframes and its structure below), where I could see all interactions in a full view. 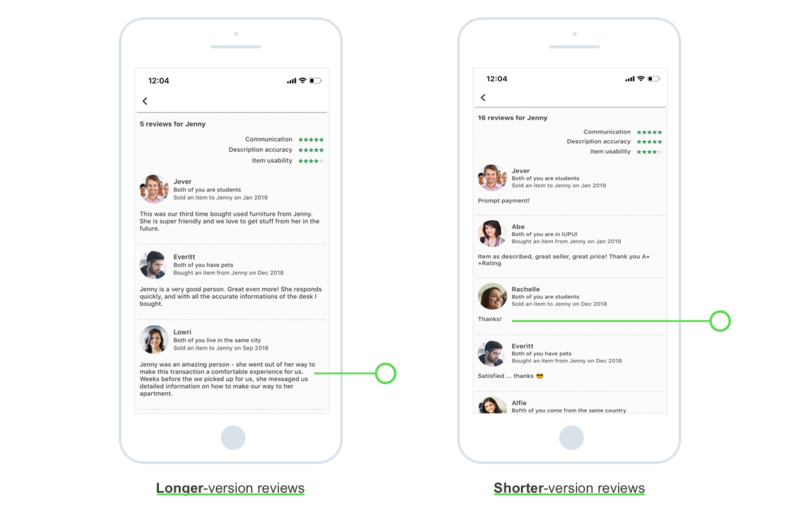 Since I included multiple roles into the mobile app, I designed interfaces for Sellers, Buyers, and Drivers, while focusing on the conversation feature to help negotiation. 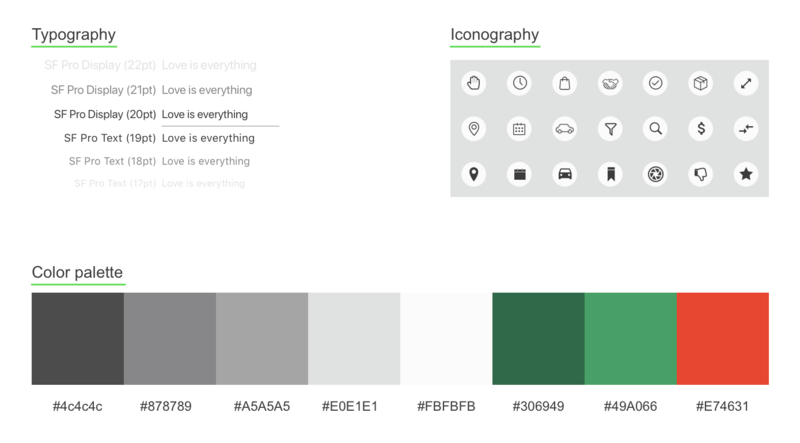 The black-and-white palette was used throughout the design to keep the focus on the content and to have better readability and accessibility (as seen the color palette below). Moreover, the color contrast was at least 4.5:1 by following WCAG 2.1 AA. A post might have multiple items. For Buyers, users were able to use the tagging feature to match between item descriptions and items in the photos (as seen the interaction video on the left below). 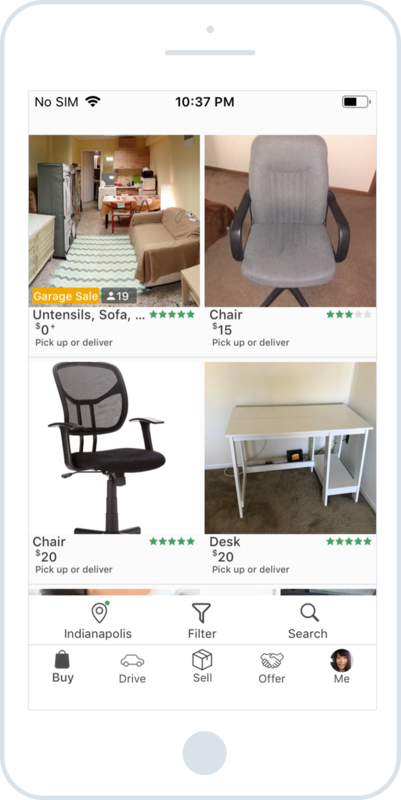 For Sellers, users tagged items on photos to mark what they were selling. (as seen the interaction video on the right below). In order to control the time of usability testing within 30 minutes, I focused on the basic transaction in the first-round hi-fi prototype. Sellers could sell items by multiple ways: photo/video, live, garage sale or donation. I tested out the prototype on four people to ensure that there were no major usability issues. Three graduate students who had online shopping experience and had no design backgrounds. One professional who had online shopping experience. (He was a software engineer. Therefore, we talked about technical feasibility and possibility.) Two of them came from Taiwan, one from India and one from USA. I made two versions for selling multiple items. One was selling items one by one; another was putting multiple items in a post. This was a within group testing. I randomly selected participants to start testing from one of two versions. At the end of the testing, I asked these four participants to arrange the order of things they cared about while shopping used products. For example, material and distance. It became the order in the second-round hi-fi prototype (as seen photos during the card sorting activities below). Term: since this platform included Sellers, Buyers and Drivers, it was necessary to use clearer terms. For example, delivery didn't explain items were dropped off by the Seller or should be pick up by the Buyer. Button width: during the usability testing, I found participants changed their hands to hold their phones because the position of button is at one side. For example, Offer button was at the bottom-right corner. Thus, I would extend buttons to the full width in next iterations. Button position: during the task of selling multiple items in a post, all (four) participants needed my prompts to find the done-tagging button. All (four) participants completed selling both an item at a time and multiple items in a post (as seen the screenshots below). Two of them preferred to sell items one at a time. One of the reasons was it's hard to put everything together and then took a picture. One of them preferred to sell multiple items in a post because it saved his time from doing repeated actions. For example, setting the price was negotiable in multiple posts. One of them said it depended on the value of items. If items had less value, he would choose to sell them together in a post. But if items were more expensive, he would post one item at a time. The testing result showed that participants chose to sell one item at a time or multiple items in a post according to their preferences. Therefore, I decided on having the feature of selling multiple items in a post, which I hadn't seen any platform did with tags in photos (as seen the difference between my design and a school-related platform below). The second-round hi-fi prototype focused on how to build trust online and to fill up the gap between Sellers, who couldn't drop off items, and Buyers, who had no cars to pick up items. I asked 13 people that how they decided on purchasing online.12 (out of 13) interviewees judged Sellers by checking ratings and reviews. Some of them started from reading negative reviews, and some of them started from recent reviews. Since most of the interviewees relied on ratings and reviews while shopping online, I made two versions of reviews: one with fewer amount but more content (as seen the screenshot on the left below); the other one version was more but with short content (as seen the screenshot on the right below). 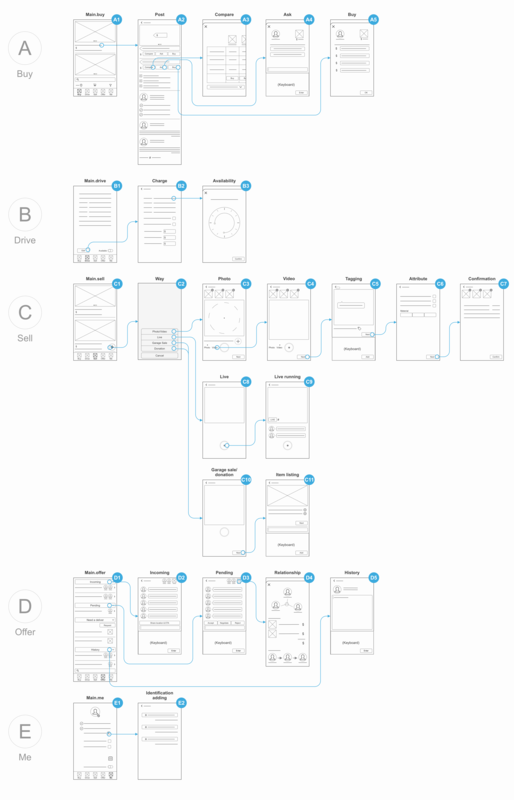 This was for observing what users' review-reading behaviors. Longer-version reviews versus shorter-version ones to see if it impacted how much users trusted reviews. 3 (out of 13) interviewees messaged Sellers to see if they wanted to buy items from these Sellers online. Both Sellers' attitudes and response time affected if Buyers feel comfortable. Thus, the response time of Sellers showed in the design (as seen the screenshot below). Showing sellers' response time helped buyers make informed decisions. From user research, most of the students (either from the Seller side or Buyer side) feel more comfortable dealing with other students. Therefore, two screens below house relationship feeds that showed the relationships between users and people online. Showing relationships helped buyers know people online. I tested out with 10 international students, who had experience of online shopping and buying used products. 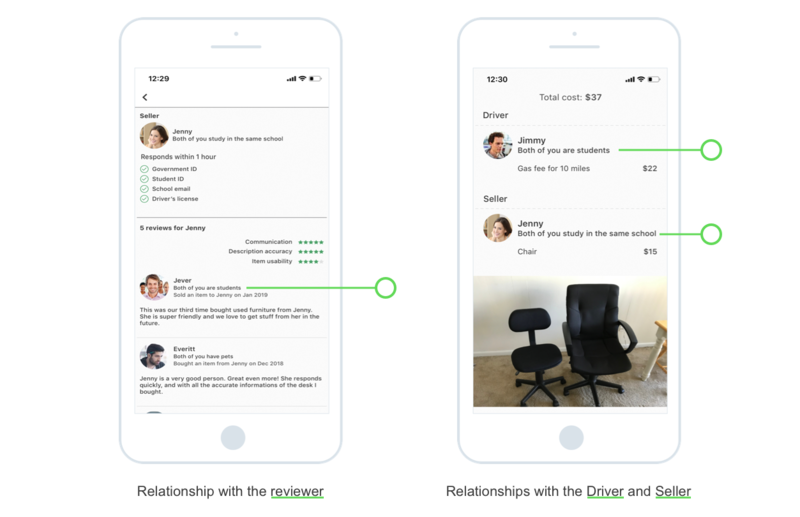 They were qualified in the usability testing because they had the budget concern of purchasing furniture for their apartments. This testing has two versions: longer but fewer reviews versus shorter but more reviews. I would like to know if the number and the quality of reviews impacted users on making decisions and trusting people. The task was to choose a chair and ask someone on this platform to pick it up. 8 of them came from India, one from Taiwan, and one from Egypt. All (10 out of 10) participants looked at pictures at the main screen first. By viewing pictures, some of them judged if the product was comfortable; some of them said the first impression from pictures was really crucial. Moreover, the price was important to the target users too. However, the main screen only showed the product price. That meant users needed to remember the whole price (product price + delivery price) in mind, which needed additional physical or coordination effort. For the next iterations, I would show the whole price at the main page or in the comparison page, in order to help users make informed decisions easily and efficiently. The styles of reviews (fewer amount but longer versus more amount but shorter) didn't change the review-reading behaviors, but it depends on users' online shopping behaviors. 8 (out of 10) participants counted on ratings and reviews, which was the way they built trust on this platform and Sellers. Nevertheless, 2 (out of 10) participants explained they didn't see these reviews useful because these reviews were about Sellers, and they wouldn't get the same experience from reading reviews. For example, a chair post at Amazon, Buyers could know others' experience of this chair. However, on this platform, reading reviews of Sellers didn't help to get the same experience about the product. 4 (out of 10) participants described that they would contact Sellers for more information, which could be more pictures or information missed on posts. For example, some people concerned if the chair fitted their body ratio, and they would ask the Seller if this chair was adjustable. 6 (out of 10) participants read the relationships with Sellers and Drivers, and said it helped them to make decisions. 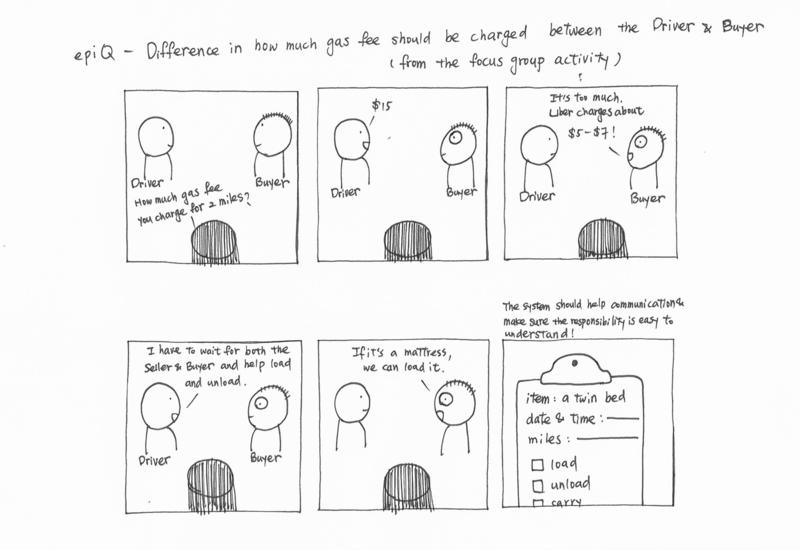 It matched what I got from the user research: students felt more comfortable to deal with other students. Trust is a deep and interesting topic I would focus on the next iterations. 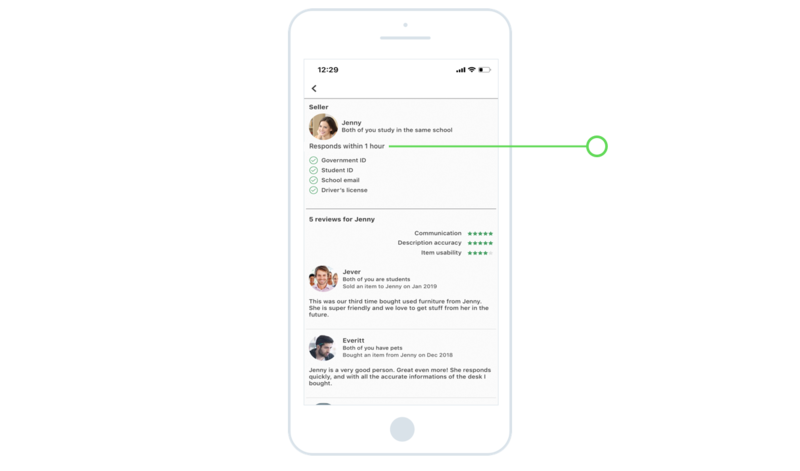 Since users count on ratings and reviews a lot while shopping online (from user research), I focus on building the trust through reading ratings and reviews. The problem is, how people are motivated to leave reviews. I would focus on how to encourage people to leave a rating or review to benefit other Buyers, rather than enforcing them to leave a rating or review before their next shopping actions. During these 5 months, I talked to many people. I got to know this is an underground need in my student community. As a student, I know what it feels like. By helping students get furniture, I got happy feeling in return. It's like I was able to do something to those stranger students, who became my friends at the end. I won't stop here but continue to listen and learn. Some day, I will implement the design into a real mobile app for helping more students.